Although the climate of teaching has changed, much remains the same. Recently, I taught in a classroom where the teacher was retiring within days. The plans and information she left answered all my questions. 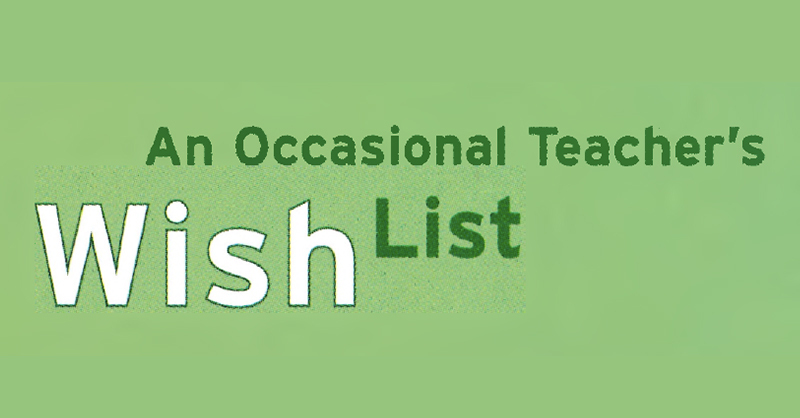 My "Wish List" is the result of teaching in hundreds of classrooms over the past ten years. 1. My first wish is that the Supervision Schedule be posted in the Staff Room. In this way, the occasional teacher can organize their day and get into the classroom long before the secretary arrives and the office gets busy. This is especially so if the occasional teacher arrives early. Arriving at 8:00 a.m. gives us plenty of time to photocopy, socialize and make ourselves presentable. 2. Most classroom teachers leave a file of activities, workshops, maps, games related to the curriculum and reading selections. One teacher I spoke with says she always leaves too much and too detailed a day plan, only to return and find that her plans have not been implemented. For a totally unexpected long term absence, the long range plan would be very helpful. Even having the new curriculum documents on the teacher’s desk is a help. Some occasional teachers are quite resourceful. I have found it never hurts to have a couple of resources in my briefcase in case the students finish their work sooner than expected. 3. An up-to-date seating plan is always useful. If there is no seating plan, and you are going to be teaching that class for the whole day, many occasional teachers will ask a student to complete one. On the other hand, the seating plan that the classroom teacher draws up could indicate with an asterisk which students are struggling with their behaviour and which students receive resource assistance. 4. A class list to check off work handed in, milk orders, photo money and field trip permission forms is very much appreciated. 5. A first year teacher I taught for last year pointed out where the class register was located. This was very helpful. 6. The school’s emergency plans could be summarized on one page. These could include procedures for severe weather, intruders, violence, etc. 7. The expected playground/yard behaviour could be summarized for the visiting teacher. For instance, is there a no-touch rule on the yard? No running on the creative playground? No snacks outside at recess? Is the garbage recycled into wet and dry cans? No bikes, rollerblades or communication devices at school? 8. The coveted relationship of Administration supporting the occasional teacher would be much easier to achieve if the teacher were assigned to a family of schools. It would be easier under these circumstances for both the Principal and the occasional teachers servicing her or his school to cultivate a rapport and appreciation of each other’s professional manner. It takes years to be recognized as an accomplished, professional, occasional teacher, just as it does for the regular classroom teacher. Having said this, may this be your best year yet! Nancy Bell has been an occasional teacher with the Upper Grand District School Board and the Wellington Catholic District School Board for about 10 years.